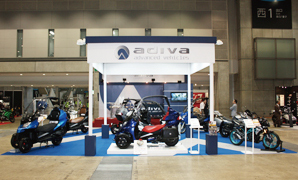 ADIVA participated in the 42nd Tokyo Motorcycle show this year. The convention was held at Odaiba, the same venue where the biggest motorcycle show in 2014 (41s t show) was held. This year it started from 27t h March and ended on 29th March. Every year, this show is held in conjunction with the arrival of spring and marks the beginning of the motorcyc le season. Despite th e lousy weather at the very last day of the show, 132,249 visitors showed up th is year, an increase o f 16% over the prev ious year ! We would l i ke to take this opportunity to thank everyone who part ic ipated and visi ted the show, making it a huge success ! ADIVA theme is the emphasis on the motorcycle lifestyle, such as the L ife auxiliary & Safety prediction. It is no t just an everyday tool for transport, it is also a hobby ! The moto rcyc le is gaining popularity in Japanese culture and drawing fans all over. Because of that, we have a new idea for ADIVA booth this year. We did not focus on the catchiness of our booth, but instead choose to showcase all our new concep t vehic les. Visitors could sati sfy their curiosity for ADIVA vehic les and enjoy their time here. Furthermore, we have talented rider Fukuyama Riko as DJ-RIKO ! With industry official talk shows and the presence of Italian maker ADIVA, this truly resembles a European motor show. Perhaps the atmosphere has finally arrived in Japan ? There are also several event guests who participated, and all ADIVA staff was involved. There was DJ demon strat ion in the booth , and the atmosphere was amazing. Overseas, this might have involved popular GP riders flying around but nevertheless this atmosphere is indeed extremely rare in Japan. ADIVA AD-Spider was officially launched ! It is part of the AD series with two front　wheels and is an improved version of the trike design. There have been several inqui ries　regarding such vehicles allowed by a normal license and fin ally it is here ! We also showcased the new 2015 ADtre, one of our best rated products in new colors. The new model comes with fitting options. The so called ?2 rear wheels? version which has received posit ive feedback last year is　also exhibited and may soon be available in the market ! An additional similar version is　also showcased and is currently used by the Singapore Postal Services. Additionally, the new road sports model were also revealed for the first time to the　world ! We look forward to making this model available in the market. During the show　we also received several inquiries on when it will be released for sale. The AD-MINI wh ich was launched in the EICMA show last year was also present, along　with the commerc ial electric scooter EM100. In the booth, it is now known as CLUB ADIVA with DJ-RIKO actively performing. The　slogan is ?ADIVA ! Impressive ! ?. We would like to greatl y thank the partic ipants, especially freelance journalist Mr. Kazu　Nakanishi who was the MC for the opening talk show and also Mr Sakayori, special guest and chief editor from the trike magazine Three Wheel. We are also grateful to all the visitors who participated in the events and shows. We are truly grateful and apprec iate all those who took the time in the 3 days, making it a huge success. We are honored yet humbled by the opportunity to be able to participate in the most　important motorcycle show in Japan. We will continue to strive and improve and do pay　attention to ADIVA? s new ideas and products. Thank you very much and we hope for your continuous support of ADIVA !